Vice Mayor Cheri Kelley and Councilman Leonard Shryock refuse to appoint a council person. The move would cost thousands of dollars, as the City would be compelled to hold a special election. 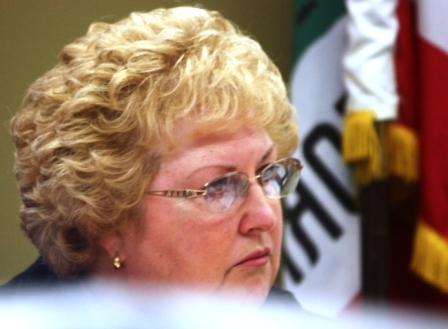 For the second straight council meeting, Vice Mayor Cheri Kelley and Councilman Leonard Shryock once again voted for legislative gridlock and inexplicably voted against the appointment of a councilperson to fill the seat vacated by Marcel Rodarte. Rodarte resigned from his seat June 30 of this year to take the Executive Director position for the California Contract Cities Association. Their action could spur a lawsuit against the City. Councilmen Mike Mendez and Luigi Vernola, clearly frustrated, tried to negotiate an appointment process, but Kelley and Shryock would have nothing to do with it. Kelley made the motion to block the appointment and Shryock immediately seconded the motion. Vernola himself was appointed years ago and then successfully won re-election. Former Mayor and Councilman Gordon Stefenhagen was mentioned in both conversations HMG-CN had with Vernola and Mendez and both agreed Stefenhagen would a great choice. California Government Code 36512 provides that the council must, within 60 days from the date of the vacancy, either fill the vacancy by appointment or call a special election to fill the vacancy. A person appointed or elected to fill a vacancy holds office for the unexpired term of the former incumbent. If the city council chooses to fill the vacancy through a special election – or if the council seeks to fill the position by appointment but does not do so within 60 days of the vacancy – the special election must be held on the next regularly established election date not less than 114 days from the call of the election. Government Code section 36512 provides the city council with another option. The council may choose to adopt an ordinance to govern the process for filling a vacancy. 1. It may require that a special election be called immediately to fill every city council vacancy. The ordinance must provide that the special election will be held on the next regularly established election date not less than 114 days from the call of the special election. 2. It may require that a special election be held to fill a city council vacancy when petitions bearing a specified number of verified signatures are filed. The ordinance must provide that the special election shall be held on the next regularly established election date not less than 114 days from the filing of the petition. A city council that has enacted such an ordinance may also call a special election without waiting for the filing of a petition. 3. It may provide that a person appointed to fill a vacancy on the city council holds office only until the date of a special election which shall immediately be called to fill the remainder of the term. The special election may be held on the date of the next regularly established election or regularly scheduled municipal election to be held throughout the city not less than 114 days from the call of the special election. Because a decision has not been made, any new vote between July 16th and August 29th will push the election to the next established election date, which is March 7, 2017, and the City’s regularly scheduled election. Consequently, the March ballot could now list three City Council seats; two full four-year terms and one two-year term. A final option is for a person or organization to file a lawsuit and compel the council to act. HMG-CN contacted Corona based attorney Chad Morgan, an election law specialist, who confirmed the time frame to either appoint or hold a special election. If they issue the writ, the court can compel the City to appoint a councilmember or hold a special election per election code 36512. Texts into Shryock went unanswered. Look at the bright side…at least we got rid of Marcel for now. My hunch is that Contract Cities will find out how useless he is and he’ll be running again in March. This is probably why he’s against an appointment. Some people just want to have their cake and eat it too. I’m glad I’m gone now. To see what this city has become is really sad. I would request that whomever you are ,to cease and desist . Stop pretending to be the Real Rick Ramirez who successfully served two terms on the Norwalk City Council. We will pursue legal action against you. You left your electronic signature and will be traced AND LEGAL ACTION WILL BE BROUGHT AGAINST YOU! The comment made on 8/10/16 in reference to Marcel Rodarte were not made by Rick Ramirez former councilmember and Mayor.. Thanks Mr. Vernola for the information being brought to attention.